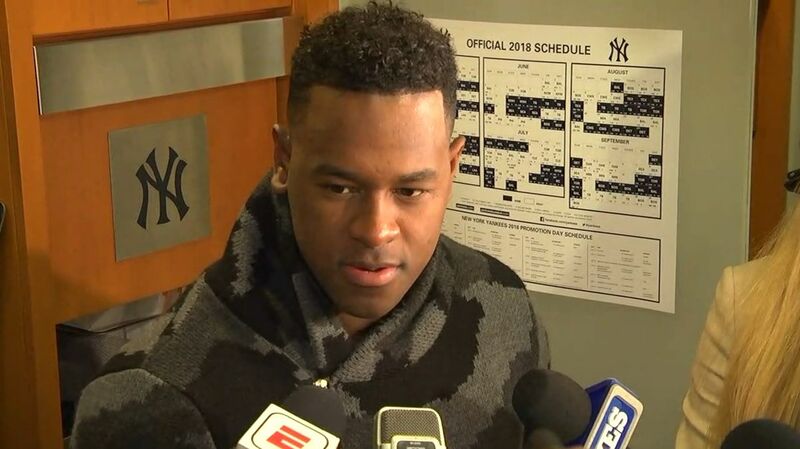 NEW YORK -- New York Yankees starting pitcher Luis Severino contended that he was not rushed as he went through what he considered a normal pregame warm-up routine ahead of his Game 3 American League Division Series start Monday night. The 24-year-old right-hander and his pitching coach also said he knew exactly what time the game started and that he was adequately prepared for it, refuting claims made by one of the game's broadcasters. "For a game like this, you have to remember what time it is," Severino said just after the Yankees' 16-1 loss to the Boston Red Sox. Severino allowed the first six runs the Red Sox scored on a disastrous night for the Yankees' arms. With the win, Boston took a 2-1 ALDS lead. 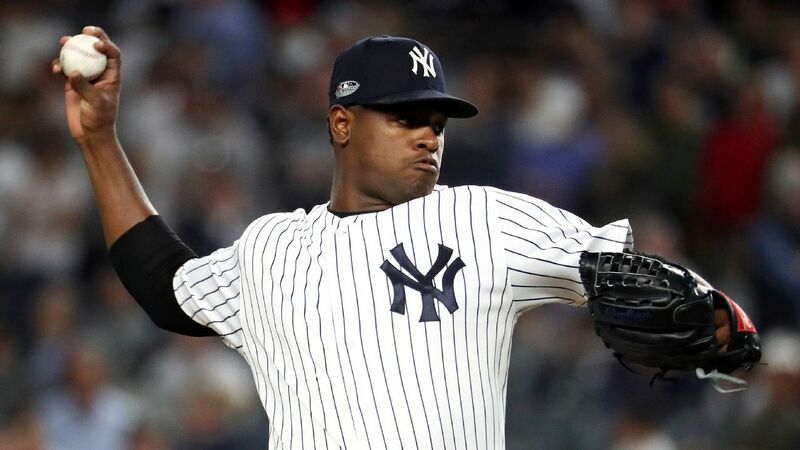 During the game, TBS broadcaster and former New York Mets pitcher Ron Darling floated a question about Severino's comparatively short warm-up time, suggesting the pitcher might have arrived to the bullpen late, minutes ahead of the game's scheduled 7:40 p.m. first pitch. As Darling spoke, cameras with a 7:32 p.m. ET timestamp showed Severino stepping onto the mound in Yankee Stadium's home bullpen. Pitching coach Larry Rothschild could be seen saying to Severino: "7:40, let's go." Severino's first pitch was delivered at 7:42. "It's very late for a starter to go out on the [bullpen] mound," Darling said during the broadcast. Severino, who learned of Darling's comments when reporters entered the Yankees' clubhouse after the game, issued a terse rebuttal. "I mean, if my pitching coach said that [it was late] to you, you can believe it. But [Darling] is not always in my bullpen, so how does he know what's going on?" Severino said. "I came out 20 minutes before the game like I usually do. I don't know why he was saying that. "I don't know who that guy is, either." Darling was a first-round pick in the 1981 draft. He went on to spend 13 seasons pitching for the Mets, Expos and A's. He recorded 136 career wins and a 3.87 ERA. On the Yankees' YES Network postgame show, Yankees broadcaster and former catcher John Flaherty echoed Darling's remarks. "There is no way you can go on a big league bullpen mound eight minutes before the scheduled first pitch and expect to be ready," Flaherty said. "Sevy's always been pretty short," Rothschild said. Added manager Aaron Boone: "He had what he intended to go down there and get done." Typically, a starter will throw 21-26 pitches and face a pair of hitters before stepping out of the bullpen and walking to the dugout for the start of the game, Rothschild said. "He didn't rush to get in there or any of that stuff," the pitching coach added. "He was able to sit down for three or four minutes and go out." Severino said he likes to begin his warm-up routine about 20 minutes before first pitch, playing catch in the outfield. After he plays catch for about 10 minutes, he enters the bullpen. A screening of Severino's pregame routine Monday showed that he was throwing in the outfield at about 7:26 p.m. ET -- less than 15 minutes before first pitch. "Before I went out, I walked through the training room and told him introductions are at :28, and first pitch is at :40. So he was pretty clear with that," Rothschild said. "The problem occurred in the third inning, not in the first inning. If there was a difference in his warm-ups, he had already thrown 44 pitches when all of this stuff happened." Severino, who pitched into the fourth, began to run into serious trouble in the third inning, when the Red Sox followed a couple of base hits with a sacrifice fly and a fielder's choice. Boston took a quick 3-0 lead. Even after that rough inning, the Yankees tasked Severino with going back out in the fourth, despite having gotten relievers up late in the third. Boone and Rothschild believed their ace could get through the Red Sox's 7-, 8- and 9-hole hitters who were due up. But two straight singles and a walk, and Severino was back in trouble. By that point, Boone finally determined he had seen enough. In came Lance Lynn out of the bullpen to replace Severino. "I didn't think [Severino] was overly sharp from the get-go. Stuff-wise, he was OK," Boone said. "He certainly didn't seem as electric as his last time out." In his previous start, Severino lasted four innings and struck out seven in a wild-card game win that put New York in the ALDS. Of the 18 batters Severino faced Monday, seven connected on balls that had exit velocities of 100 mph or faster. According to ESPN Stats & Information, that's the first time Severino had given up that many hard-hit balls in a game since May 19 at Kansas City. After his departure, the Yankees' bullpen didn't fare much better against the Red Sox hitters. The poor pitching performance culminated in backup catcher Austin Romine entering in the ninth inning, making his only big league pitching appearance. It was the first time since 2015 that the Yankees had used a position player to pitch in a game. Romine wished he had entered the postseason game in some other, more traditional way. "No, I didn't envision myself getting in these playoffs in that role," Romine said. "But I'm just here to try to help the guys out there." Romine, who topped 90 mph on one pitch, got two quick groundouts before giving up a home run to Brock Holt, allowing the Boston infielder to complete the cycle. Luis Severino shuts down reports that he was late to the ballpark for his start against the Red Sox.